The Bible is the story of God leading humanity out of darkness and into the light. One massive overarching theme that we can see in Scripture is that God has been slowly moving his people further away from sin and closer towards his ideal. So, with the arrival of Jesus, it was finally time to set the record straight. God came to us in the flesh to say “enough is enough.” No more misinterpretations, no more accommodations, no more concessions. And while there were quite a few things Jesus set the record straight on, we’ll be looking at three major ones and how they were foreshadowed in the Old Testament. In this second article of a series called “Enough is Enough” we’ll be looking at temples in the Old Testament and how God never wanted them in the first place. The Jewish people worshiped at their temple for hundreds of years before Jesus came on the scene. It was the center of their worship of God. But before there was ever a temple there was a Tabernacle. The Tabernacle, meaning “residence” or “dwelling place”, was the portable earthly dwelling place of God among the children of Israel from the time of the Exodus out of Egypt, through the conquering of the land of Canaan. It was basically a tent. Interestingly, the idea for a temple originated with Israel’s King David, not God. David felt guilty when he compared his magnificent palace with the humble Tabernacle tent (2 Samuel 7:1-2). God never asked David to build a temple, nor did He give any instructions. Compare this with the tabernacle: not only did the idea for the Tabernacle originate with God, but God meticulously revealed every detail of the Tabernacle to Moses. The concept of a “great magnificent, famous, and splendorous” (1 Kings 8:13; 1 Chronicles 22:5) temple stands in opposition to the philosophy of worship given to Moses (Exodus 20:25; Deuteronomy 27:5-6; Joshua 8:30-31). They were limited to building simple altars, nothing elaborate. This is likely so that the their attention would be on God alone and not the altar. It seems probable that God would prefer a simple tent-based Tabernacle over a “great magnificent, famous, and splendorous” temple for this same reason. When David comes up with the idea to build a temple, God says that it is not needed, that he has never asked for such a thing (2 Samuel 7:5-7). God goes on to say that it is his desire that he himself build a house [temple] and that it will be his son, Jesus. The Lord declares to you that the Lord himself will establish a house for you: When your days are over and you rest with your ancestors, I will raise up your offspring to succeed you, your own flesh and blood, and I will establish his kingdom. He is the one who will build a house for my Name, and I will establish the throne of his kingdom forever. I will be his father, and he will be my son. Even though God clearly tells David not build a temple (1 Chronicles 17:4), he does it anyway. David reports that he is forbidden from building a house to God because “he is a warrior and has shed blood“ (1 Chronicles 28:2-3).5 Despite a temple not being God’s will, and being forbidden from building it, David really wanted to. So knowing he was forbidden from building a temple, instead he made “extensive preparations” (1 Chronicles 22:5). David was obsessed and utterly consumed with the project. Scripture seems to indicate that David had insomnia over it, something quite common for people suffering from compulsive work addiction (Psalm 132:1-5). Three times the text emphasizes David’s preparations (1 Chronicles 22:5, 14; 29:2-3). He appointed masons and prepared iron, bronze, and cedar in abundance (1 Chronicles 22:2-3). He created plans for everything: “the vestibule, its houses, its treasuries, its upper chambers, its inner chambers, and the place of the mercy seat” and for “the courts of the house of the Lord, of all the chambers all around, of the treasuries of the house of God, and of the treasuries for the dedicated things”. These plans were so detailed that he had already weighed out exactly how much gold and silver was to be used for every table, bowl, pitcher, and plate—every item was already pre-designed and the exact amount of material was set aside and made ready. David budgeted it, funded it, created all of the plans, and provided all the materials for it (1 Chronicles 28:11-18). He even had the location picked out (1 Chronicles 21:24-26)! One could argue that David did so many “preparations” that all Solomon needed to do was mouth the word “start.” However, David did not even allow that much. It was David himself who gave the first order to begin construction, thus disobeying God’s command. God’s promise to David was that God Himself would build a house for David. However, David did not rest in God’s promise. Instead, David did everything he could to make sure his hard work came to fruition—even going so far as to make his son publicly promise to finish the project he began. The first temple was not God’s will but was the product of David’s flesh. The first temple was eventually destroyed and rebuilt years later. Around the time of Jesus the second temple still stood above the Gihon Spring on the east side of Jerusalem. Jesus prophesied that the temple would meet its destruction sometime within a generation and he was correct. In the Temple was a curtain that separated the “Holy of Holies” (the place of God’s presence) from the rest of the building. At the moment of Christ’s death, that curtain was torn in two from top to bottom. Now the way into the Holy of Holies was open for all people, for all time. When Jesus died, the curtain was torn, and God moved out of that place never again to dwell in a temple made with human hands (Acts 17:24). God was through with temples and their religious system. The book of Hebrews explains how Jesus is now our only way to God’s presence (Hebrews 10:19-20). Significantly, the book of Hebrews bypasses and ignores the Jewish Temple altogether, identifying all of the typical functions mentioned in Exodus, not with the temple, but with the tabernacle. The Temple isn’t mentioned because God never wanted it. Today there is no Jewish Temple in existence. God allowed for the existence of a temple building but now we know, through the New Testament, that God wanted to build his own Temple. That Temple, we are told, is Jesus Christ and his body of believers (John 2:19-22; Matthew 12:6; 1 Corinthians 3:16-17; Ephesians 2:19-22; Revelation 21:22). The promise that God made to David all those centuries ago was fulfilled in Jesus. 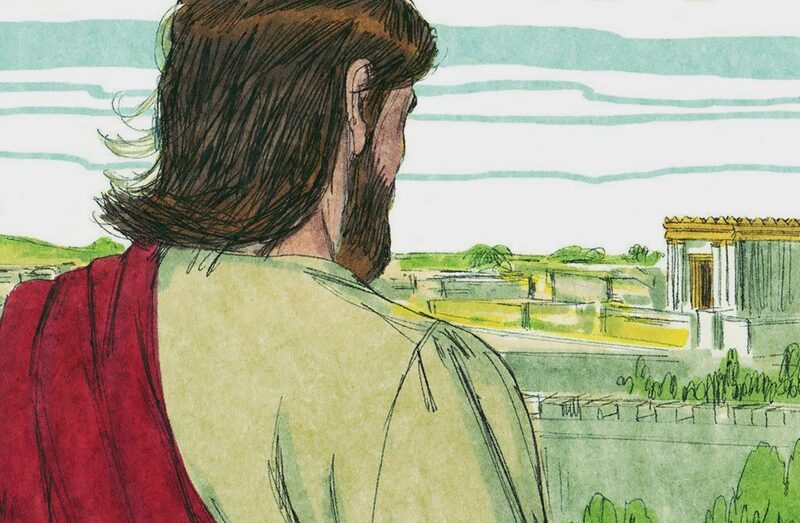 David didn’t listen to God, but Jesus came anyway and established his true Temple. God never wanted a Temple building. He used it for a time, but now with Jesus it is done away with once and for all. Enough is enough. Addressing possible objections: The prophet Isaiah said that the one to sit “upon the throne of David and over His kingdom” forever would be none other than “Mighty God” (Isa. 9:6-7). And Zechariah describes a kingly and priestly “BRANCH” who would sit and rule on this throne (Zechariah 6:12–13). The revelation given under Nathan’s Vision fits well into this overall Messianic context. Putting 2 Samuel 7:14 aside, these other passages are clearly referring to Messiah alone. Why should Nathan’s Vision be any different? Furthermore, there doesn’t seem to be a lapse of time after Nathan’s Vision to make Solomon fit even a partial fulfillment. Rather, God’s promise of building a house for His name is connected with a distant, future time period after David. At a minimum, it was to occur after David had died: “The LORD tells you that He will make you a house. When your days are fulfilled and you rest with your fathers, I will set up your seed after you, who will come from your body, and I will establish his kingdom.” (2 Sam. 7:11c-12) It is during this time after David that this “house” would be built (v. 13). Yet, David did much preparation for the Temple in his own lifetime and personally commanded at least some of the construction to begin. 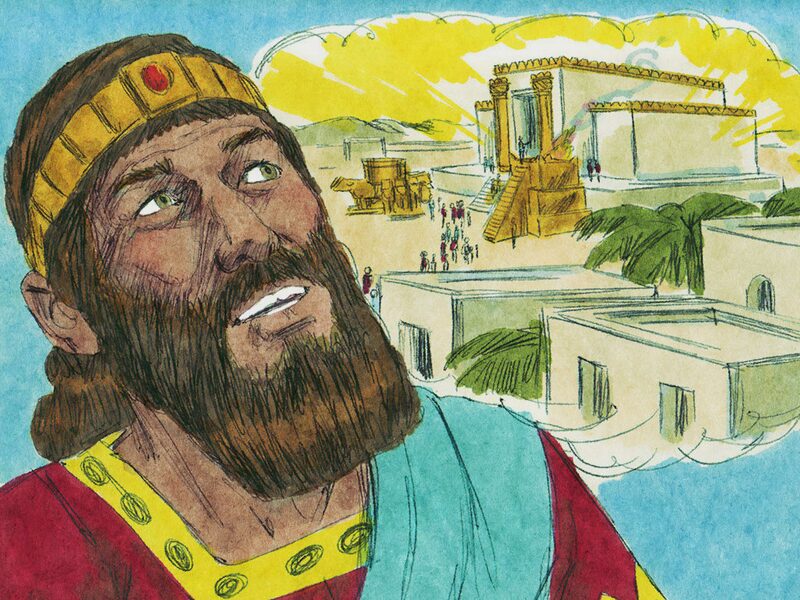 Finally, the building God promised would be built by one of David’s descendants who would be an everlasting king ruling eternally over an everlasting kingdom. Moreover, God’s mercy would never depart from this descendant: “But My mercy shall not depart from him, as I took it from Saul, whom I removed from before you” (2 Sam. 7:15). We cannot find a full or partial fulfillment of this in Solomon as (1) he was not an everlasting king, (2) the rule of his kingdom ended historically with the destruction of Jerusalem in 586 B.C. and (3) God did take His mercy from Solomon as a result of his unfaithfulness like He did with Saul. This illustrates another sin that God accommodated for a time but is now abolished with Jesus: violence.